A couple of weeks back we had a question on the ‘Q&As’ page regarding front entrance ex London Transport Leyland RTLs. In response Bob Gell contributed the above shots which were taken at the North Weald Rally, 6 July 2008 and the following information of an ex Guernseybus converted RTL. 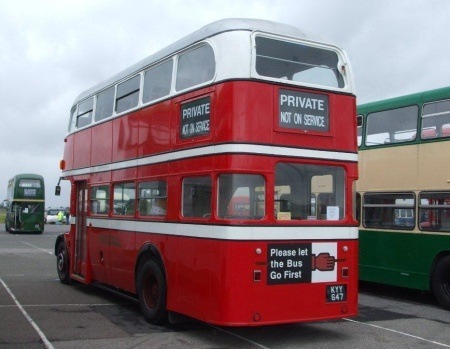 As can be seen it is now preserved and back to carrying its original London Transport fleet number of RTL 1004 but not quite the original livery. Bob is lead to believe that KYY 647 was converted by Guernseybus in their own workshops, for use as back up on inclement days to their open top RTs one of which was was RT 2494 registration KXW 123 with a Weymann body; it carried Guernsey registration number 54636. Guernseybus may have moved the entrance to the front, which I will come back to later, but as can be seen from the insert shot the staircase was only moved towards the centre of the bus and the stairs went rearwards. The subject of the original query, JXN 366, the former RTL 43, new to London Transport in 1949 joined the A1 Services fleet in February 1958, owned by T & E Docherty of Irvine. A photo of that vehicle can be seen here. It is thought to have been converted ‘in house’ in this case, the staircase was moved to the front as per normal front entrance vehicles. In 1971, it passed to Duff, a fellow member of A1 Services, who operated it until December 1973. It is now in preservation. Two questions arise out of this posting there is always at least one, firstly, KYY 647 carried two registrations 47312 and 995 during its time on Guernsey does anyone know why. Secondly whilst researching into these conversions other sites and documentation described the conversion of them to forward entrance not front entrance, Bob thinks that could spark a whole debate on its own, I think he could be right. By common consent, Front entrance means just that – at the front, by the driver. Forward entrance means as far forward as possible – ie just behind the front axle (and engine) of a standard half-cab (or full-fronted) vehicle. I am guilty of using ‘front’ entrance for such vehicles but reading supports the use of ‘forward’ entrance. It seems that front entrance should be used for more modern vehicles, such as the Atlantean, Fleetline, etc. I think some confusion arises where fleet lists show anything not centre or rear entrance as a code ‘F’. Not one, but two forward-entrance RTL’s from different sources. These were complete news to me. Thanks for the interesting post. The first picture gives the impression that the main object of the modification may have been one man operation – i.e. angled window on left hand side of cab, as was done to various half-cab single deckers by sundry operators. I had quite a few enquirers regarding what the conversion of the rear entrance looked like, well, Bob obliged with the following shot. Wow – art deco rounded glass at the rear – very expensive, I’d have thought. Better to see an off-centre rear view than full rear one, because the large rear pane of glass downstairs would be off-centre and the overall look quite asymmetric. Also the offside window ahead of the rounded one seems higher than its counterpart this side and the other side windows. In general, though, a neat job. Hi Chris I think the higher window you refer to is the new Emergency Door see the little shot inserted in the text. Ah Yes, Spencer, I missed the little photo: the door isn’t so clear on the upper photos. Thanks for clarifying. The team of inhouse coachbuilders at the then operating Guernseybus were tasked with relocating the rear entrance forward in order to allow the company to continue to operate its entire fleet with just a driver onboard – which was standard practice on the island. As for the registration number changes, between 47312 and 995, it’s mainly to do with a relatively lucrative market for cherished number plates in Guernsey, which has numeric only registrations. The number 995 may well have been sold (or indeed bought as an investment) by Guernseybus during the double deckers tenure in the island. 47312 would, as a registration number have very little value. You have a photo of my guernsey bus I restored this bus in 1984 the reg on it was JPA 81V as this was the year it came over from the island it was sold for £65 and then it cost £110 pounds on the fery. I got Swansea to give me a reg for it’s year 1958 it was then LSV 748. Hope you find this of use. RTL 1004 was the Lambeth Safety Bus in the 1970. The Abbots Langley Transport Circle bought it from a scape yard in Essex near Ongar. We had the bus for a number of years. We had to sell the bus on when we lost our parking space, and was unable to find another close to our base in Abbots Langley Herts’. 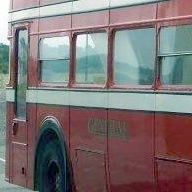 I use to own this bus wondered where it ended up and what is it doing now.